Manufactured from hot dipped galvanised steel. Available in 4 or 6 poles. A full range of accessories is available to compliment the fan. Range of adjustable pitch case axial fans specifically designed and certified to extract air or smoke at 400°C for a minimum period of 2 hours in the case of a fire. Certified to EN12101-3 Standards. Precision die cast aluminium, available with 3, 5, 6, 7 or 9 blades, with adjustable pitch angle depending on diameter. 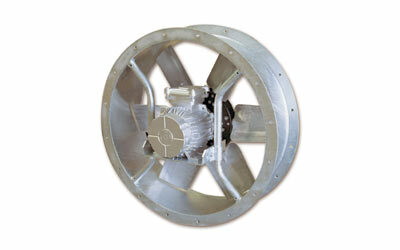 The complete adjustment of this impeller provides precise selection of pressure and airflow. Asynchronous, three phase, rated at 400°C/2h and available in four (4) and six (6) poles. Rated at 230/400V for motors up to 3.0kW and 400V 50Hz for those greater. IP-55, Class H.
The range is extensive, covering 8 standard duct diameters from 500-1250mm. Airflow range up to 31m³/s. Available with 4, 6 pole, single speed motors and 4/8, 6/12 pole, two speed motors.